Jenn's Rating: 3.5 Stars!! Ok Product! Water, Mineral Oil, Cyclomethicone, Glycerin, Octyldodecyl Mysristate, Trehalose, Butylene Glycol, Macadamia Ternifolia Seed Oil, Cetearyl Alcohol, Sodium Acrylate / Acrylolyldimethyl Taurate Copolymer (And) Isohexadecane (And) Polysorbate 80, Glyceryl Stearate, Rice Ferment Filtrate (Sake), Stearic Acid, Beeswax Glyceryl Stearate (And) PEG-100 Stearate, Polysorbate 60, Dimethicone, Microcrystalline Wax, Sodium Polyacrylate, Sorbitan Stearate, Methylparaben, Oryza Sativa (Rice) Bran Extract, Perfume, Phenoxyethanol, Propylparaben, Water (And) Glycerin (And) Sodium Lactate (And) Sodium PCA (And) Sucrose (And) Urea (And) Sodium Citrate (And) Tartaric Acid (And) Malic Acid, BHT, Caramel, Disodium EDTA, Prunus Armeniaca (Apricot) Seed Powder, Water (And) Glycine Soja (Soybean) Seed Extract (And) Coix Lacryma - Jobi (Job's Tears) Seed Extract (And) Sesamum Indicum (Sesame) Seed Extract (And) Oryza Sativa (Rice) Bran Extract (And) Vigna Radiata Extract (And) Helianthus Annuus (Sunflower) Seed Extract, Yellow 6 (15985). 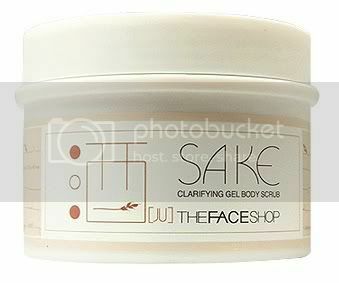 Sake relieaves the tention from both body and soul with its smooth, sensational scent while purifying and hydrating skin. 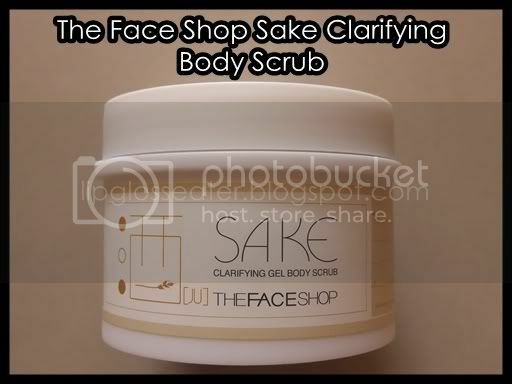 Additions of various grain extracts along with Apricot Seed and Rice Husk powders to this gel body scrub exfoliate rough skin for a smoother, clearer complexion. 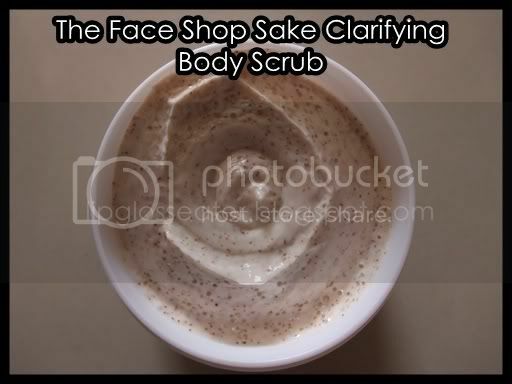 This scrub comes in your usual tub with a screw lid. I personally think that all scrubs should come in a squeeze tube or a bottle with a pump or something! Using a tub of scrub in the shower is not really practical!! This is part of a wedding gift i received from a few lovely friends! :D The first thing that struck me was how overpowering the scent of this was!! Phew!! 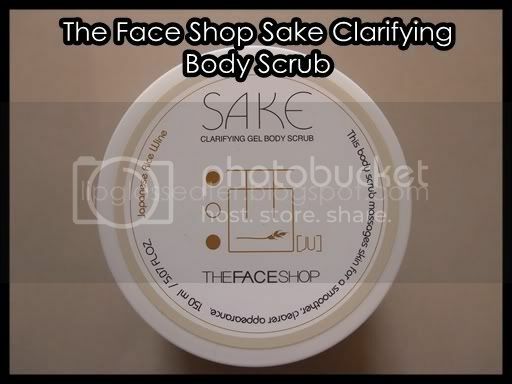 The second thing was that it wasn't very scrubby (i personally prefer my scrubs very grainy), so i used quite abit of it the first time... and found that it left my skin feeling really dry and tight!! 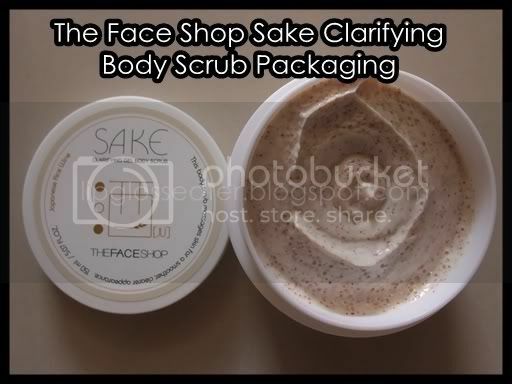 Only then did i realise that this is actually a chemical exfoliator! That'll teach me not to read labels prior to using a product!! lol!! thanks for the review :D I may need to check this out ! ooo i have one of this sake range. the body noursing lotion or something like that.